You guys happened to pick one of my favorite dessert flavors for the poll last week. It’s a rare day that what I want to win actually wins. I got lucky this time around! Besides using something with almond, I also wanted to make something super-easy to make. 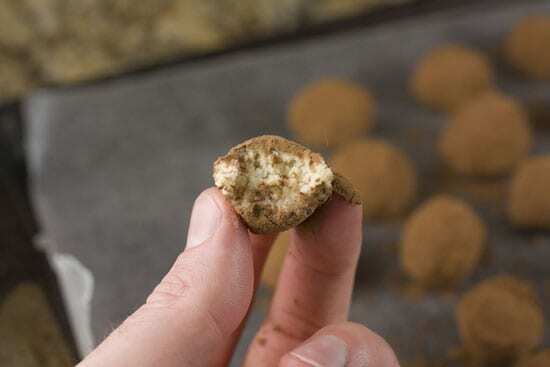 In fact, these Almond Truffles are so easy to make you don’t even have to turn on your oven! This was my first attempt at making truffles and while they didn’t turn out perfectly shaped and I would probably need a few professional lessons before getting hired by See’s candy, I was completely happy with the result. 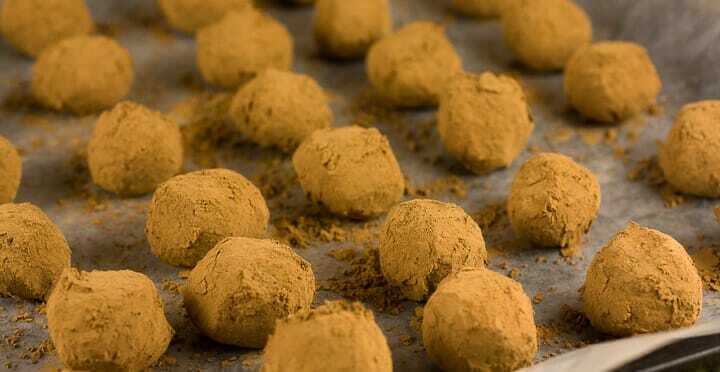 Simple almond truffles mixed with toasted coconut and tossed in cocoa powder. This is a quick and easy no-bake dessert that is a show stopper of flavor! 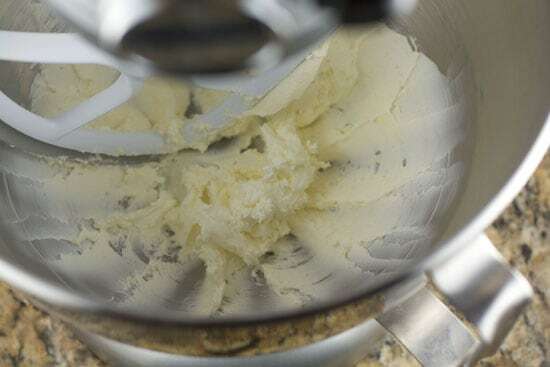 1) Cream together butter and cream cheese using a hand mixer or stand mixer until it is fluffy and smooth. 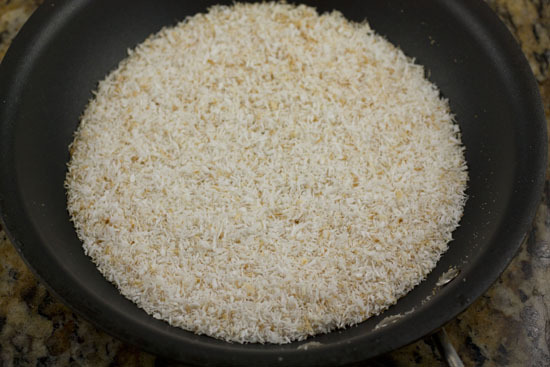 2) Toast coconut in a dry skillet over medium-low heat until it’s a light brown color, about 4-5 minutes. Be careful not to burn the coconut. 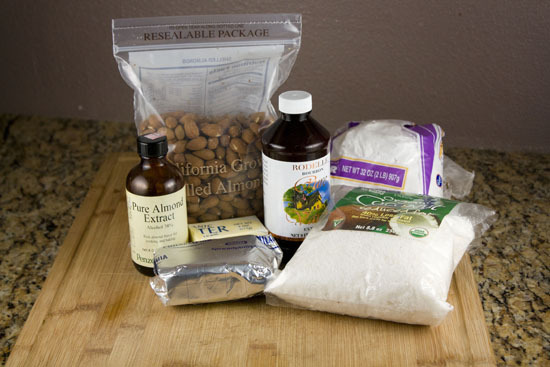 3) Process almonds in a food processor until they are a rough meal. 4) With cream cheese/butter mixture, add in extracts and powdered sugar. Then stir in coconut and almond meal. 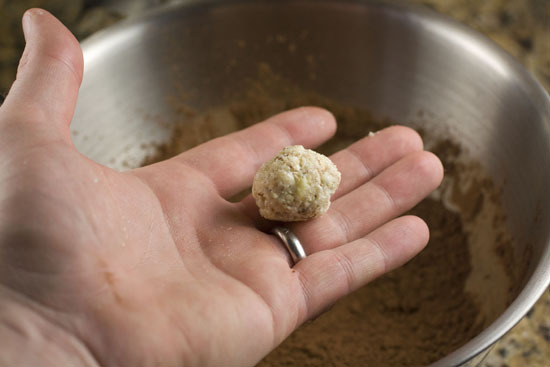 5) Make teaspoon sized balls of the dough and roll them into a tight ball with your hands. Toss them in cocoa powder until completely coated. 6) Chill for storage or serve immediately. These are best served at room temperature. I had never made truffles before and the first thing that shocked me was how little material actually goes into the balls. To make about 40 truffles, I only used 1 tablespoon of butter and 2 ounces of cream cheese. Sure, there are a lot of add-ins and stuff, but the actual binder for the truffles is just a very tiny amount of these two ingredients. 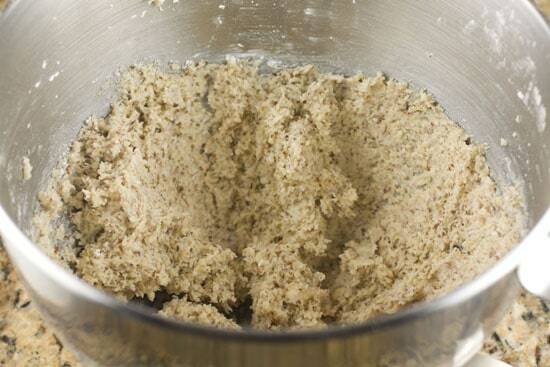 Add the butter and cream cheese to a mixing bowl and beat it until it is a light and smooth texture. I used my stand mixer for this, but you could just as easily use a hand mixer. After a few minutes of beating you should be all set. This actually makes a lot of truffles. After this, mix in your extracts (vanilla and almond) and also the powdered sugar. Now for the fun stuff. 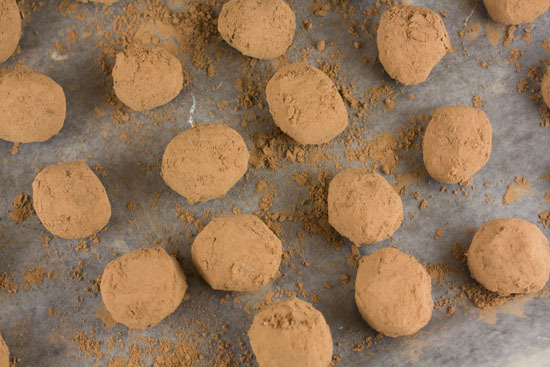 This is where all the flavor and texture comes from for these truffles. 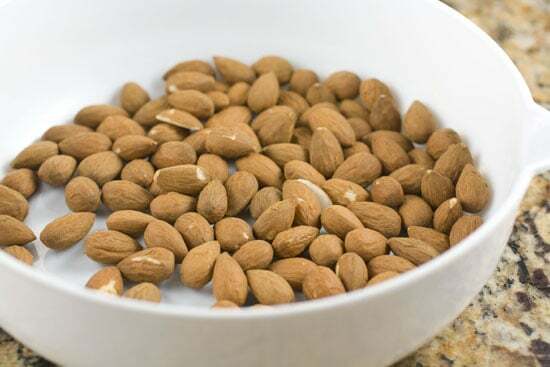 For the almonds, just measure out 4 ounces (about a cup) and quickly process them in a mini-food processor. 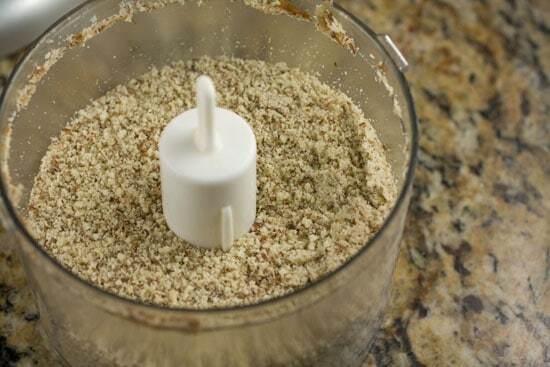 If you don’t have a food processor, I would just put my almonds in a plastic bag and crush them with a mallet or something. Your goal is to get a really nice almond meal. Besides the almonds, there’s also coconut in this recipe. I’m not always a huge coconut fan, but I really liked it in this Almond Truffles recipe. The key to coconut is to make sure you toast it lightly before using it. I just toasted mine in a dry skillet for a few minutes over medium-low heat. Be sure to keep an eye on the coconut and stir it frequently. It can go from toasted to burned in about 30 seconds. This is what you’re shooting for! Add in the almond meal and coconut to the butter, cream cheese, and powdered sugar. Stir this all together and your truffle mixture is done! Try to not eat this with a spoon. Keep in mind that truffles are supposed to be bite-sized treats. This stuff is pretty rich and nobody wants a candy bar sized truffle. I literally used a teaspoon to measure out my truffles. To make one, scoop out a heaping teaspoon of the mixture and then lightly roll it into a ball using your hands. 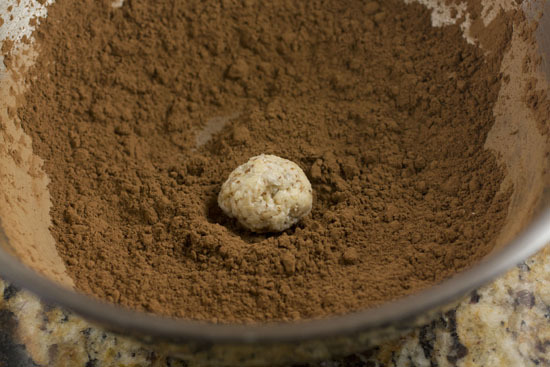 Toss the ball into a bowl of cocoa powder and shake it around to coat it completely. You can do more than one at a time. Once you get the hang of it, you can do 5 or 6 at a time and then just toss them all with the cocoa powder at the same time. It took me maybe 10 minutes to pop out about 40 of these bite-sized goodies. As I finished them, I just set them out on a baking sheet lined with parchment paper. The paper just makes it a bit easier to clean up. There’s really no danger of the truffles sticking to anything. Not bad for my first truffle. While these are supposed to be one bite treats, I bit one in half so you can see the story. Pretty delicious stuff. The cocoa powder is sharp and intense and then the whole thing just melts in your mouth. Store these in the fridge, but they are best served at room temperature. So, if you can, take them out of the fridge 10 minutes before eating them. I find this next to impossible because when I open my fridge, there they are, and I just pop one in my mouth. So, that serving method works too. These Almond Truffles are really unique and they look and taste way harder than they actually are. Give them a shot if you’re a truffle fan, an almond fan, or a fan of good stuff that requires very little work! These look pretty awesome. Nut allergies in the house mean that they won’t be appearing here any time soon, but I wish they could. These are amazing! They are simple to make and taste great. My family loved these as well. I will be making these again. « Brown Butter Oatmeal Cookies Recipes Home » The Internet Kitchen: What’s Up Winter?